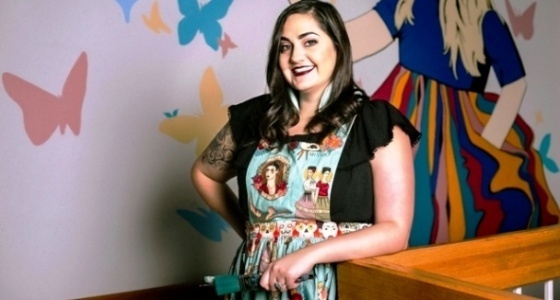 A passionate visual artist who's made her mark regionally by involving communities in beautifying public spaces has been chosen as the Fond du Lac Public Library's Idea Studio summer artist in residence. Stephanie Harvey was selected among a field of applicants for the paid position during which she'll work on original art in the studio and conduct public workshops. Harvey is a professional artist who lives in Kimberly and who works primarily in photography and printmaking. She's taught art classes to all ages throughout the region and enjoys a wide range of arts and crafts, including embroidery, hand-brush lettering, watercolor painting and crochet. "I am passionate about spreading the joy of art and creativity," Harvey said. "I love being able to show any skill level, any age that making art is fun, therapeutic and it can really change your community." Harvey will be creating and displaying art in the Idea Studio, with public-access hours 1-8 p.m. June 27, July 11, July 25, August 8 and August 22. She'll be featured in a one-woman show in the library's Langdon Divers Gallery in October. She'll offer public free workshops on stencil art and lincocut print-making on the fourth Mondays of June, July and August. Stencil art workshop attendees will learn about the history of street art, create a reusable stencil and use it to brighten up a local area in our community or even around the library. "There are endless possibilities for sharing and showing your art once you learn how to create and use stencils," she said. "Stencils add color in unexpected places." 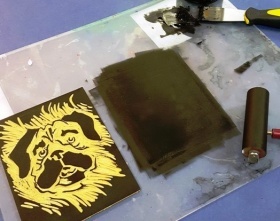 Her workshop on linocut relief-style printmaking will make use of the Idea Studio's new press. Students would carve linoleum blocks and use them in the press, which Harvey says is "one of the oldest and most awesome forms of art." Harvey has her professional artist's fingers in several pies. 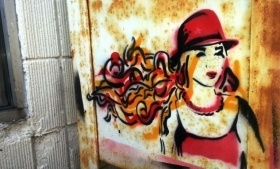 Her current project with the Fox Cities Performing Arts Center works with middle school students exploring street art. She's employed by the Kimberly-Little Chute Library as visual arts coordinator and serves as community engagement curator for the Northeast Wisconsin Arts Association. She's a regular art workshop leader at The Trout Museum in Appleton, Richeson School of Art & Gallery in Kimberly, Kimberly-Little Chute Library and at private events. The UW-Oshkosh Fine Arts grad helped start and maintain the artists in residency program at Kimberly-Little Chute Library and was an artist in residence last summer at the Appleton and Kimberly-Little Chute libraries. She's the owner of the business Boomerang Photography. Personally, the mother of two is married to her "best friend of 15 years" and runs three book clubs and two short-story clubs. Her favorite artist is Frida Kahlo, she loves Mexican food (and margaritas), is learning Spanish and her favorite color is black. For her work in the two-month residency program, Harvey will earn a stipend of $750 and will receive up to $500 in reimbursed expenses for materials. The residency program is funded by the Seefeld Endowment Fund, which was started in 1992 to support special library programs and initiatives. The Idea Studio is the library's permanent do-it-yourself zone in the lower level with equipment to use for free and DIY programming. It's open 3 p.m. to 8 p.m. Monday through Thursday, 3 p.m. to 6 p.m. Fridays and 9 a.m. to 4 p.m. the second and fourth Saturdays of the month. Summer hours – June through August – are 1 p.m. to 8 p.m. Monday through Thursday, 1 p.m. to 6 p.m. Friday and noon to 4 p.m. every Saturday. More information is available at www.fdlpl.org/ideastudio and on the studio's Facebook and Instagram pages, found at Idea Studio FDLPL. Pictured above: Stephanie Harvey, an example of community stencil art and linocut-print preparation.